Passes are available for 3–, 6– or 12– webinar programs at a discounted rate! Announcing our new webinar subscription packages! You and your organization will benefit from increased participation in the HealthLeaders Media webinar series. Register for the Webinar Pass and benefit from this great content at reduced rates! Passes are available for 3–, 6– or 12– webinar programs at a discounted rate. Choose the programs that cover the most important topics and challenges for you and your team throughout the year. Both live and on-demand versions of our programs are available to subscribers, offering flexibility to engage when it’s most convenient. New programs are broadcast regularly so be sure to check back often to see new titles. To redeem your Webinar Pass credits, simply call our Customer Service Department to alert them of your selection. You'll receive an e-mail confirmation of your order along with a special redemption source code. 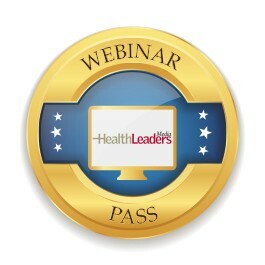 You’ll use this code throughout the year when calling Customer Service to order an HealthLeaders Media webinar. How do I keep track of my Webinar Pass credits? That's even easier! We do all the paperwork for you and send periodic reminders as you use your subscription. Or if you prefer, call our Customer Service Department at 800-650-6787 for more information or to register today. *FirstLook product and Organizational Leadership Series Product are excluded.